Sometimes, when you're struggling to fine-tune a system, it's hard to figure out where the fault lies. In this case, I'd been struggling for -- I won't say how long -- to align the disk brakes on a Hase Pino tandem that's new to my shop. No matter what I did, how often I repeated my efforts with slight variations, or how hard I stared at the darn thing, I just couldn't get the disk brake pads and get rid of the scraping between the front wheel disc brake rotor and the brake pads. It made no sense. Is this an Avid issue? A Hase issue? A moi issue? It got to the point where I simply lost all patience and went and rode it anyway, scraping and all. I grabbed the nearest friend and we rode for a half-dozen miles just to see how the bike handled. (That Pino is very cool, by the way. Wow.) However, being concerned about vapor lock, we kept it to a reasonably slow speed. If you have a Hase Pino with Avid Code hydraulic disk brakes that you just can't align, look for this, among the other typical things to check. 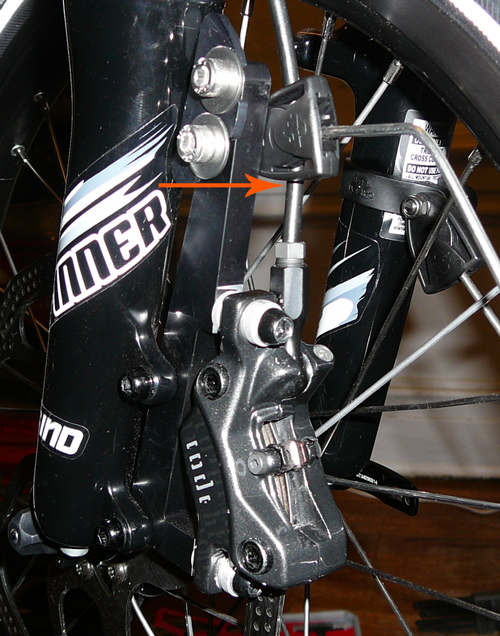 On the front wheel, if you have fenders, the hydraulic hose has to go around a clamp holding the front fender. On my build the hose went around the left-side clamp on the wheel side and there is contact between the hose and the clamp. It turns out that there is enough horizontal pressure in that contact to prevent the calipers from floating freely while the bolts of the Caliper Positioning System™ ("CPS") were loose. This thwarted the CPS from aligning the calipers correctly to the rotor. I didn't have a free pass on the rear wheel either. The disk rotor was rubbing a lot less than the front rotor, but, still, more than it should. (I like it not to rub at all.) I checked and, sure enough, there was a culprit: a hose clamp that pulled the caliper a little out of alignment when the CPS bolts were loose. I unfastened it, followed standard procedure, and voila the caliper aligned as it should.